Lisa Snowdon was spotted out and about in London last week. The British TV personality was casually dressed in jeans and a striped tee for the outing. It must have bit cold that day because she unexpectedly bundled up in a scarf. It was a surprising addition since the outfit was quite warm weather-appropriate. How do you like Lisa’s off-duty style? It’s very simple and to some extent, ordinary. However, what we like about the outfit is how put together she looks. It’s true what they say, you don’t have to wear the most expensive clothes or shoes. What matters is you wear the right pieces — those that flatter your frame and make you look neat and elegant. Wearing a striped nautical top with dark blue denims is a classic Parisian-chic combination that is fail-safe and fool-proof. We can’t deny that it always looks good. Also, adding a scarf to an outfit usually makes a difference. In Lisa’s case, it dressed up her attire by a notch. Sure, the purpose was more functional than decorative, but at least she hit two birds with one stone. 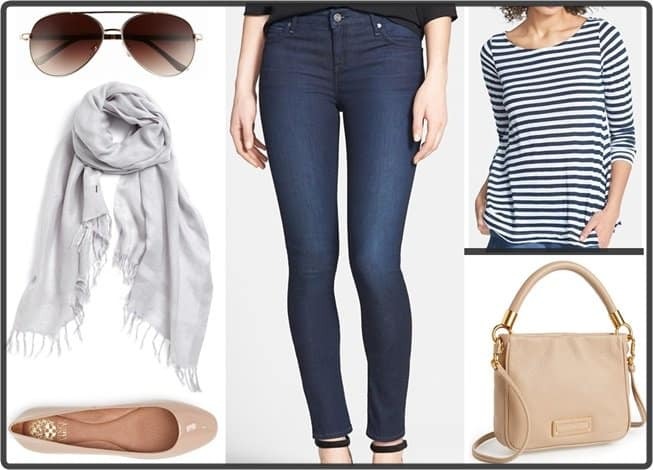 So would you like to copy Lisa’s nautical-inspired scarf style this season?